some very strong up-front running that will greatly improve the squad at the State level. currently ranked 3rd in Division IV California! The rest of the top 10 inlcuded St.
individuals in their grade level races below. and cruised to a 35 point win. They are currently ranked 3rd in Division IV California!! the lead using her speed that gave her a win at the 2003 State Track Meet at 1600 meters! 2nd 19:02, and Annie Adams (Aptos), 3rd 19:05, ran great consistent races throughout. runner-up finish with their strong front-running. Daniel Rocha (Madera) returned to defend his Earlybird title and did it in fine style. claimed a 2nd place finish with Bellarmine in 3rd. addition of transfer student Russell Bush from Santa Cruz for the win with 89 points. to 3rd at 106 points. and girls combined program of the day with another top 3 finish at 3rd with 126 points. medals with 3rd at 101 pts. Weâ€™d like to thank all of you that made the 2003 Earlybird Invitational the best yet. the best sport in the world!!!!! See you all in 2004 and good luck to everyone in 2003!! Meet results and information are on our team website. Anticipation is running high as the 2003 cross country season kicks off with the 9th Annual Earlybird Invitational hosted by North Monterey County High School in Castroville, CA! This meet promises to be the best yet as more than 50 teams and well over 1,000 athletes are expected to converge on campus this Saturday, Sept. 6th. This just may be the most competitive early-season meet in the state of California!! Highly ranked teams and individuals will once again rip through the spectator friendly 3.0-mile course. 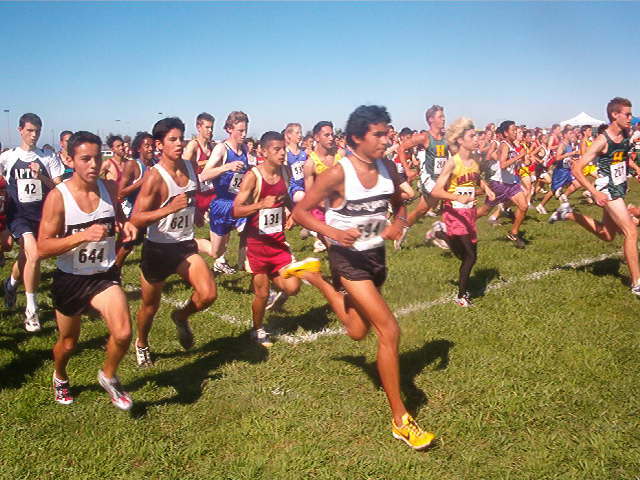 As cross country is a true team sport, we’ll start by highlighting the top teams followed by the top individuals. For the girls' teams, San Lorenzo Valley will defend their Earlybird team title from 2002 with a fine returning group that is ranked 3rd in California and 1st in CCS in Division IV. They bring big meet experience with multiple State and Section Championships in recent years!! They’ve had a great summer and will not give up their title easily. They looked impressive in a recent all-comers 2 mile with 6 girls under 11:54! St. Ignatius enters the meet ranked 1st in CCS Division III and could challenge SLV for the title along with Presentation with their #2 CCS DIII ranking. They both feature some great up-front running and strong traditions. Madera returns the bulk of their runner-up Earlybird team from 2002 and could challenge. They have big meet experience having qualified for the 2002 CA State Meet. Other top 10 contenders include Los Gatos, Aptos, Clovis West, Clovis East and host North Monterey County. For the boys’ teams, races will be run in grade levels but overall individual times will be combined to sort out the overall squads for “bragging rights”. Madera returns to defend their Earlybird “time title” and should do it in fine style if last week is any indication. A bit off the rankings radar, Madera surprised many last week at the Granite Bay Invite defeating Jesuit 45-86! Jesuit entered that meet as the top California squad and 15th in the country! Madera will fly on the coast come Saturday. Host North Monterey County will challenge for the title coming off of last years runner-up finish to Madera. The Condors return the bulk of a team that surprised many all year on way to a 12th place State finish. They’ve had a great summer and should see the fruits of their labors. They enter the season ranked 2nd in California and 1st in CCS DIII! Serra will send the seniors of their top ranked squad that comes in ranked 5th in state and 1st in CCS DI. Look for King City to challenge for a top 3 finish as they enter ranked 3rd in state and 1st in CCS DIV. Other top contenders gunning for a top 5 finish include Carlmont, #2 in CCS DII, Bellarmine, #2 in CCS DI, and St. Ignatius, #3 in CCS DIII. All in all, 15 of the top 25 ranked CCS teams will be on hand! The race for top individual girl honors could be fierce as many great harriers race each other for the first time in 2003! This race will include many of the top ranked individuals including #’s 1-3 on the DIII state list! Leading is 2002 Earlybird individual champ Ciara Viehweg (St. Ignatius) ranked #2 in the state! 2002 runner-up Melissa Grelli (Presentation) enters 2003 ranked first in the state and could steal the title. 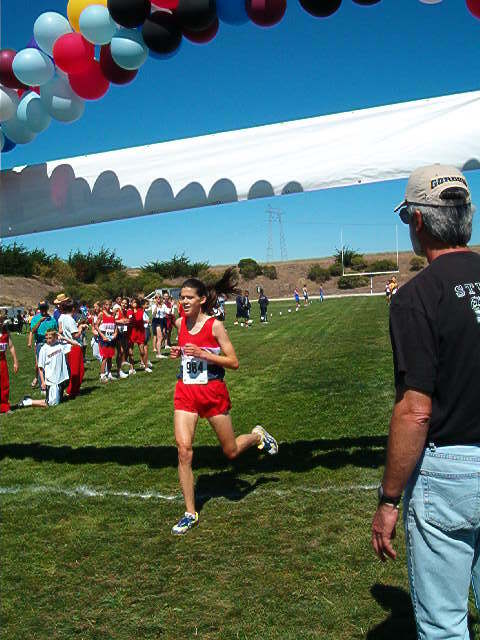 Remember, she is the defending 2002 California State Cross Country Champ! These two better not blink or they could miss Alicia Follmar (Saratoga) flying by with her blazing speed that netted her a mile (4:51) state title! Alicia enters 2003 ranked #3 in the state. That’s right, #’s 1-3 in the state right off the bat!! Other top 10 contenders include Sarah Zerzan (Notre Dame-Belmont), Christine Jones (Los Gatos), Annie Adams (Aptos), teammates Stephanie Hamilton and Emily Romo (SLV), and Corina James and Vanessa Rodriguez (Madera). The individual boys won’t disappoint with the highest quality field ever assembled for this early-season meet!! The seniors will be a “Shoot-out in the OK Corral”! It’s loaded!! Alex Dunn (SLV) comes down from the hills to defend his top time from 2002. 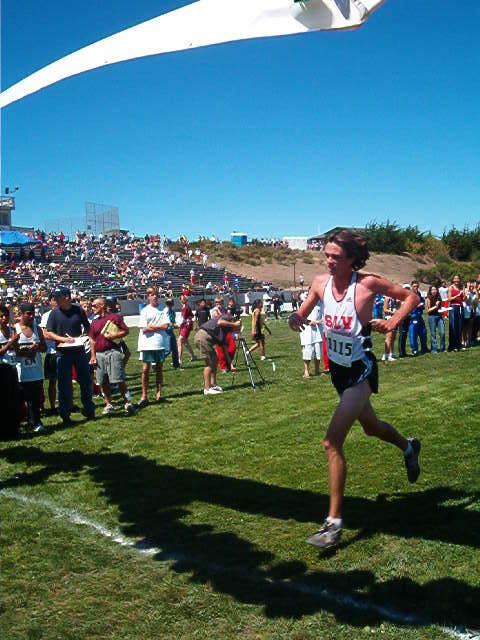 He recently ran a great 14:57 5k on the track and should tour the NMC course in just about the same amount of time. He went 15:44 last year but look for that to be dismantled. Alex won the DIII state title last year! Kyle Shackleton and twin Drew Shackleton (Carlmont) come from the north and are capable of doing runner-up duties. Dominic Vogl (Serra) leads a strong senior class for them. Look for locals Jacob Evans (Aptos) and Darren Mattinson (Harbor) to mix it up with the leaders. Jacob brings the fastest legs to town with his 1:52 (800) and 4:11 (1600) PR’s, so you better break him early! Darren has made huge improvements from last year and could be a sleeper. Michael Hannon (Mills) has a great 4:20 1600 PR. Daniel Jensen (Silver Creek), Danny Tapia (North Monterey County), Jonnie Rivera (San Benito), Alex Guney (Bellarmine) and teammates Jorge Oliveros & Marco Ayala (King City) are all top 10 contenders. Getting a medal in this one will be tough! All in all, the CCS is well represented here with 25 of the top 35 seniors for 2003!!! The juniors aren’t as deep but will be just as quick up-front. We’re predicting another Madera vs. North Monterey County battle. Last year Madera squeaked out a 1 point win in the sophomore race with 3 guys in the top 5! North Monterey County countered with 2 guys in the top 5 and 4 in the top 11!! This year could be much the same. Look for defending champ, Benny Madrigal (Madera), to battle once again for the win. He’s coming off an impressive 5th place run at the Granite Bay Invitational. Last year he held off two charging Condors for the win. Nathan Huerta (North Monterey County) and Keli Parker (North Monterey County) will once again be battling up front. Nathan enters the season ranked 8th in the state DIII. He’s had a great summer including a 31:36 romp at the 6-mile “Wharf to Wharf”. Keli is primed for a great junior year and will use his devastating kick come crunch time. Claudio Moreno (Madera) and Jesse Perez (Madera) return to try and duplicate their top 5 finish. Jose Garcia (North Monterey County) and Enoch Trujillo (North Monterey County) will attempt to break up the Madera juggernaut. The sophomores are led by defending 2002 Earlybird champ Daniel Rocha (Madera). He’s coming off a fine 12th place finish at last weeks Granite Bay Invite. Also returning from last years top 5 are, in order: Daniel Morthie (St. Ignatius), Jose Sanchez (Greenfield), Kevin Collins (SLV) and up-and-coming Ivan Alfaro (North Monterey County). The freshmen are always a mystery this early in the season and we just hope they go the right way this year J. Check out the North Monterey County cross country team website for meet results and pictures, and we hope everyone enjoys the meet!